High performance race cars, their drivers, and teams supported by manufacturers participating in a sport for which the combined, visceral thrills and sensations of burning tires, megadecibel roars, pungent racing fuel and throngs of enthusiasts can be difficult to convey, even on the largest big screen television. Motor racing is an intense, dangerous and exhausting sport that tests race technology, drivers, pit crews, reporters and, in our case wireless technology to their very limits. Most people are not fully aware of what a harsh environment the interior of these muscled-up race cars are like, let alone the demands they place on drivers, crews and, in our case, broadcast technology. It's not a case of just placing a few cameras inside with some duct tape before hitting the tarmac. Getting technology that can perform consistently over a considerable amount of time in such an extreme environment is not easy as you might think, but in our case, we found our answer. The International Motor Sports Association (www.IMSA.com) is the premier sanctioning body for sports car competition in North America and the pinnacle of sports car racing in the United States. This includes multiple classes of cars that would, for example, compete in the European 24 Hours of Le Mans. 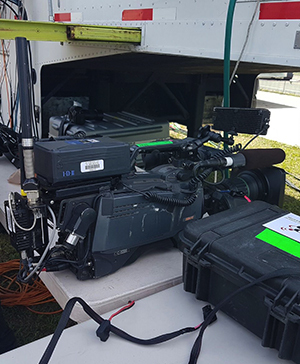 3g Wireless deployed a range of on-board camera systems for the first two races of the IMSA Series, the Rolex 24 at Daytona (formerly known as The 24 Hours of Daytona) on 28-29 January 2017, and the Mobil 1 Twelve Hours of Sebring that took place from 15-18 March 2017. These are marquee events in the endurance motor racing calendar, both with long histories of legendary drivers, teams, manufacturers and brands. We integrated into our purpose-built, in-car multi-camera system core technology from DTC Domo Broadcast Products, namely the Solo 7 Nano HD transmitter. The 3g developed system enables us to switch between multiple sources, including a panning roof camera, an in-car camera typically looking at the driver, another looking out the front wind screen, and occasionally one looking out the back depending on the type of car. All of the audio and video data gathered and encoded by the in-car systems are returned to a 3g developed custom receive infrastructure with DTC's PRORXD 8-Way Diversity RF wireless receiver platform at its core. We extend our ground-based receive infrastructure so that every receive site - basically every antenna on the track - receives simultaneous video and audio data from all of the 18 cars we typically equip as they move around the track, which usually covers somewhere between three and four miles. I mention that because it's not like repeating a mile and a half oval with nothing but left turns. These are road courses that cover a diverse range of terrain, but our DTC backbone enabled us to effectively receive and manage data from all of the 18 cars during both races, anywhere on the circuit, without pain or interruption. In addition to the cars hurtling the track, another major part of any sports broadcast, especially motor racing, is the pit reporting. Pit reporters are deeply invested in developing multiple story lines, which is especially important in a 12 or 24-hour race. There are lots of story lines as the cars and drivers encounter and deal with extreme conditions, not just in terms of the demanding physical and mental requirements of the endurance race itself, but the unfolding dramas related to the systems, teams, and manufacturers. The reporters capturing those stories as they happen also DTC Solo 7's as the core transmission technology for the pit cameras. There are typically anywhere from two to four cameras in the pits each assigned to talent who are covering the action. During pit stops the cameramen actually go over the pit lane wall to get as close as possible the high-precision refuelling and maintenance that takes place in split seconds. One of the beauties of the Solo 7 is that it is so small, yet powerful, that it enables reports - whether it be motor sport or ENG - to easily access areas that might previously have not been possible, at least not possible while still maintaining RF connectivity. It's important to remember that the drivers of these cars are operating in extremely harsh environments. The cars are hot, loud, and vibrate like crazy - and it's a variety of different vibrations depending whether they are coming out of the pit lane or careering down a bumpy back straight at 200 mph - and the equipment is operating in those same conditions - but the DTC technology has operated flawlessly. It's been rock solid in really hostile environments and, more importantly, over a long period of time. And, contrary to assumption, we don't necessarily get primetime placement of our in-car technology to make sure it's all cosy, comfortable and protected. We do work closely with the teams to determine where our equipment can safely go within each car, which can vary with the make, model and classification of each. It can be a question of, "Here? No. Here? Nope. Here? Maybe." We might end up near an exhaust manifold that's purging hot gases from a 10,000 RPM engine. Now that's extreme, but that's just the way we like it.